today... while walking up the hill to work I came across this... walked back and picked it up. A rusty old key. Just there on the pavement. While I was looking at that little spot of cobalt paint that splashed onto my trainers a few weeks back. And?! What do you think?! ... I've been meaning to do this for ages: widen the margins and doing something about the far too grey look of the blog template. So: a much simpler template allows even me eejit to do some html, colourise the sidebar and label cloud accordingly, plus: long overdue, to add some more links. Yesterday I finished (?) one of the oil paintings I've been working on for a while. It's the one where haziness was the challenge: how to work with light, atmosphere and mood. This is where I got to. Looking at it from the far end of the corridor - our usual spot for a good viewing and critting I felt a bit lost for words. I kind of gathered where I was heading with this one when my friend to whom I showed the first WIP picture from a while back got all dreamy eyes and loved it. It's kind of nice to know that I can do beautiful paintings - I think. But what is it really in there that makes it so romantic? Palette, light and the filling in of associations? These set of oil paintings are turning out FAR more representational than what I was trying to get it. The task for them was all about light, light and more light. - Hence the liberal use of white. So, there is plenty of light. But also - thanks to the raw siena, red earth, lemon yellow and cobalt blue - I've ended up with a very organic palette: It's easy to mix the most beautiful greens, earthy browns, and plenty of light and dark variations of these. Thirdly, the field and the haze at the line between fields and trees is rather organic in marks and lines also: I was trying - as indeed with the exaggerated line in the mixed media drawing of the same view (here) to abstract this line - it's been the bit in the scene that really got me, the one I was trying to capture and play with - but: it just integrates, neatly becomes a part of it and helps again at making it dreamy. Ok... here the second lot of winter drawings... well, not really drawings anymore but more mixed media on paper - and the paper did take a bit of a battering, as the not very good photo of Fields in December #4 shows. It warped in despair over my reworking of the middle ground: layers of acrylics got hidden by layers of gouache only to get more acrylics on top... Not sure if that is how it's supposed to be, but I did like the washed back effect of the gouache. So, here the palette is much warmer - thanks to the red iron oxide. But the generous applications of white, and in particular the dark greys that cobalt blue and raw siena make knocked it back a bit, or rather turned the heating off. That cobalt blue/ raw siena has quickly turned to one of my new favourite colours. Well, probably not all that new really, if I have a closer look at my range of pastels - it's been there all along, but with this bit more systematic colour learning, I now get a sense of how to get there through mixing. What am I talking here... there is no cobalt blue in my acrylics, so it's thalo and cerulean, with some sepia and raw siena. Hahaha... now I remember again the hesitation of applying a new layer of these different ones on top of the first one. But, hey, seems to be working alright. Also, the lemon yellow has been coming into its own: with titanium white gouache it lifts the middle ground of #3, defines tree outlines in #4 and did a lot more magic on the oil paintings... which will be next one for posting. These past few weeks of mixing, experimenting and observing what happens when have been great. And it's been one of those times again where I'd wish I had more time :). Oh, and finally: my absolute favourite in these is the line in #3. The weekly drawing/paintings sessions are about to come to a close over the next couple of weeks and I have begun to bring home some of the drawings that I did over the past few weeks. If you remember, I've been doing all these winter frozen hazy landscape sketches in late December, and been working them up both in mixed media drawings and oil paintings. So, here's the first drawing/mixed media lot: two scenes worked on paper - the paper shines through and in fact provides the dominante hue. In addition, I've used some acrylic paint - parchment, grey, cerulean blue (I think) and some raw umber. The paint is worked with knifes, scratched and reworked, sponges and brushes. The lines are acrylic inks, in sepia, grey and royal blue (which is thalo blue). The process wasn't that straight - I kept working over it again - mainly to get some depth and texture into the woodlands, but also to define - move forward/backward - different masses. Besides the winter mood, I was keen on developing a range of marks for the trees, in forground, further away or just at the horizon line. Here, varying hue, value and lines took some time. In the end, I faded quite a few of the very linear trees with gouache/acrylic washes - white and cerulean to make them less dominant. I like how both of them work together, yet in terms of composition, complexity work very differently - and to see that the simpler one (#2) actually works compositionally. What I was somewhat surprised of was just the extent to which my winter theme carried with it moody, overcast skies and bleak emptiness - far more than I intended, in fact. And I can show how I used the limited palette (cobalt blue, raw siena, lemon yellow and red earth) for the oil paintings in another set of drawings too, to moderate and temper that freeze. - That's for the next post. plus titanium white, lots of titanium white. Of these colours, it's only been the lemon yellow which I had already learned to use and value (though largely as underpainting ground for some pastel paintings - notably, this abstract one here). In fact, of the earth colours, both raw siena and venetian red (or any red iron oxide) would be ones where I could theoretically appreciated their value and importance for paintings but would invariably opt for umber and yellow ochre instead... feeling somewhat smug that I managed to deal with the opacity of the latter in oil while I detested it in acrylics. Similarly the titanium white got banned from my palette in favour of naples yellow light to try and avoid chalkiness. But over the paste two weeks I've managed to demolish my white tube in no time and urgently need to buy some new one. The plan with these colours is to get to some winter colours with low sun, bare grounds, some woods in the distance and alternatively clear blue or overcast skies. Of all the colours, I am quickly becoming excited about the possibilities that both the siena and the red iron oxide offers: the most luminous, earthy variations on browns, greys and greens. In particular when mixed with the cobalt it just makes the palette sing. With these colours I've started four paintings based on the German winter sketches - they are in their early stages yet, and I'm smiling to myself as they are currently strongly in the spring or autumnal mood rather than winter... but hey, patience will get you there, Gesa. Merzmalerei was the term the German artist Kurt Schwitters (1887-1948) gave to his assemblages and collages. Merzmalerei - a wonderfully lautmalerisches word. Apologies: I'm too lazy for the dictionary: it's one of those words that is 'painting with sounds' - is expressive just by the sounds it makes. Merzpaintings - its origins seem to lie in one of Schwitter's early found papers - the cut off of a Com-merz-bank notice. Schwitters lived in Hanover - the shopping destination from where I grew up. And the nickname Hangover gives an indication what me and my friends thought about the city back then. So, I probably will have seen some of his collages on school trips to the local museum. But I will remember to make time to go and visit the Sprengel museum again next time I have some time. Schwitters was loosely associated with the Dadaist movement, but living in provincial Hanover provide plenty of insulation from it all the same. With this quote taken and translated from this website, go and have another look at the many Merzpaintings he made. My internet was off yesterday and I scared myself about just how put out I was by that... In any case. I've been getting a few promises for found papers - and it's interesting to see the kinds of associations people have offered up in response to my project call. I've made a box for collection, and ideas and thoughts are rummaging around in there and in my head as to where this may go. Here are the images of my figure drawing session. Did I say that they did another one while I was away? It's quite funny how groups end up with different dynamics. Over ten weeks, that drawing class usually includes a figure drawing session: with different people in the group standing, or: sitting model. The group membership is quite fluid from term to term, and depending who's there, different things happen: well, kind of obvious, isn't it? In any way: this current group is very good fun, and I think that there'll be a couple more figure drawing nights before it'll be finished in five weeks. Two weeks ago, we had three 20 mins poses - these two here and one with myself. I hadn't dared to do that - standing model before - but it was great: a bit apprehensively I went around after, seeing what these people had drawn of/with me. And how nice that was - all very different, some just little details, some portraits, some the whole pose and in different styles and media. Very cool. 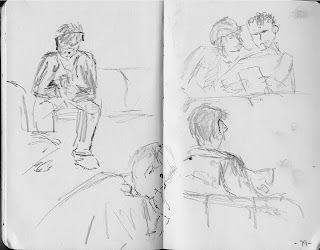 ... last week and people sketching. The flight was delayed on the way out of Glasgow. And while everybody was sitting around reading, I got sketching. While everybody sat it was easy to sketch in peace. Another time I tried some people standing about, but that was far too fleeting. My Wednesday drawing group has also been doing some figure drawing... but I need to photograph those sketches first. Thus, in the meantime: people at the airport. wonderful... so the first responses are back: and I'm looking forward to post from New Zealand, Chicago, Jerusalem, Belfast, Kreuzberg, Goettingen and Uelzen... How nice. I'm particularly pleased about the last one: there is effectively only one person I'm in touch with who lives where I grew up other than my parents - hi Toja! - and I haven't really been in touch much of late. So, this has already been good. Any body else? This is going to be an interesting one - I think I'm not much of a collector - well, I do have plenty of things that remind me of people and places but it's not really paper stuff I collect. And I think I need to learn collecting scraps of paper and bits and pieces again... Similar to how painting teaches me to see and experience the around me differently, this collecting project will do something similar. Yesterday's mail brought a lovely surprise: Lindsay had sent me the first installment of found papers from her day-to-day. I had mentioned to her an idea for a project that had been rumbling around my mind for a wee while: doing collage as in glueing paper onto paper is even more fun if the paper glued onto each other is found, not bought - found papers are those stumbled upon, incidentally or even accidentally - and most of Picasso's and Braques's papiers colles and Schwitters's Merzmalerei assembled such found papers. With many of my friends and colleagues scattered across Europe and further afield, I wondered if they would not send me some found papers from their day-to-day lives - Found papers. From Somewhere. Lindsay's mailing now prompted me to finally pull these ideas together, to make up a small flier and to send it to the people I know elsewhere. Similarly, if you're reading this and would like to be part of it, just drop me an email - see address on the sidebar and I could send you some more details. The plan is to collect found papers over the next few months and then develop them into a series of collages - I don't have a much clearer idea than that at the moment, but am sure it'll develop - most art projects do that.